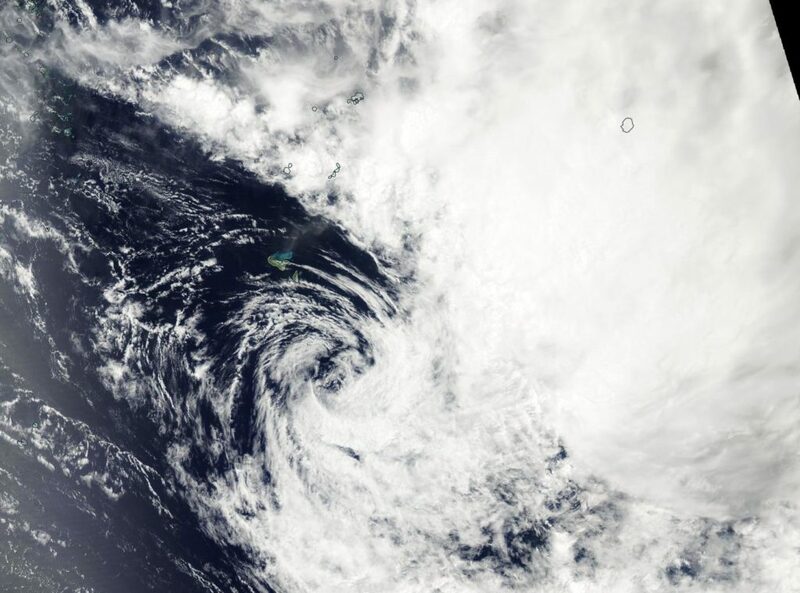 A visible image of short-lived Tropical Cyclone Neil was taken from NASA’s Aqua satellite on Feb. 9. The image showed that northwesterly vertical wind shear was affecting the storm and pushing the bulk of clouds to the southeastern quadrant. In general, wind shear is a measure of how the speed and direction of winds change with altitude. In order to understand how it affects a tropical cyclone or hurricane, think of a tropical cyclone as a vertical rotating cylinder. The different levels of rotating winds in the center of Tropical cyclones need to be stacked on top each other for the storm to strengthen. If there are outside winds pushing against the cylinder near the top, it affects the balance of the entire cylinder and that’s what happens when vertical wind shear pushes against a storm. It pushes the center and weakens (or wobbles) the rotation of the entire cylinder (storm). On Feb. 9, the Joint Typhoon Warning Center noted that the final warning was issued on Neil .